It is our sad experience that there is little use in talking to very young girls who already have their “steady” boy friends. Keeping company makes them feel wise beyond their years. Because they are acting as if they were adults by this practice, they usually feel that they have a right to talk back to adults who tell them it is unwise, dangerous, and harmful to their later lives. We hope our correspondent is an exception, though the way she tosses aside her mother’s advice would indicate otherwise. Steady company keeping is only for those who have a right to think about marrying within a reasonable time; who are free from responsibilities that company keeping would interfere with; and who are mature enough to recognize and resist the dangers that go with company keeping. A 14 or 15 year-old girl in high school fulfills none of these conditions. She shouldn’t and ordinarily doesn’t want to think of getting married for a good number of years. She should be occupied with the business of getting an education, and nothing can so thoroughly nullify her efforts in that regard as the excitement of puppy love and the time wasted on frequent dates. Above all, she is too young to be aware of the danger of sin that is inherent in her own nature and that may be presented by her equally immature boy friend in the close associations of adolescent company keeping. There is great need of a corps of young people of high school age who will resist the all too common practice of regular dating and steady company keeping. Such young people must be humble enough to realize that their elders are not talking through their hats nor adopting the roll of kill-joys when they advise against the practice. They must know that while again America makes light of it, true Christian principle condemns it. Is it wrong to continue to see a certain boy secretly when your parents have forbidden you to go out with him? I am 21 years old and my father is quite wealthy. The boy I have been going with comes from an ordinary family and he is working his way through business college, hoping to obtain a good job when he finishes. My mother and father argue that he will probably never be able to provide for me as they have done all my life so far. That is why they have forbidden me to see him. But I think I am in love with him, and I don’t care if we do have to live on a small income after he graduates. Of course I wouldn’t marry him until then, but if I don’t see him in the meantime once in a while I shall probably lose him. I’ve been having lunch with him now and then when I’ve gone shopping, and I want to continue to do so. Even though you are 21, with some right to decide your own vocation, there is a presumption in favor of the wisdom of your parents’ requests and commands. That presumption will yield only to clear indications that they are unreasonably interfering with the happiness of your future and the will of God for you. On the side of the wisdom of your parents is the fact that ordinarily it is not easy for a girl who has had all the conveniences and luxuries that wealth can provide to adjust her mode of living to a much lower standard. Nor, ordinarily, can a girl be very happy if, in order to marry, she has had to incur the displeasure and lasting opposition of her family, especially if she has had a pleasant and easy life with her family. Only if a girl has a strong, spiritual character, a proven capacity for mortification and sacrifice, and a great earnestness about her task in life, should she consider a marriage that will mean giving up much that she is accustomed to. Since it is pretty hard for you to judge whether you have all these qualities, I suggest that you obey your parents to this extent: tell the boy of your parents’ wishes and commands; tell him that in obedience to them you will not see him for three months; during the three months test yourself, by rather rigorous mortification, to learn how many of the luxuries of your home you can do without; and at the same time try to convince your parents, in all kindness, that they should permit you to see the boy at least once in a while, on condition that you will make no decision to marry him without talking it over thoroughly with them. I am 16 years old, and in my last year of high school. My parents permit me to go out with boys only once a week, and then they insist that I go out in the company of my older brother. All the other girls of my age have dates as often as they like, and I feel that I am old enough to go out like that too. I know the dangers of going out, but I feel that I have to face them sometime. Don’t you think my parents are too strict? The chief reason you give for demanding that your parents permit you to go out freely, viz., because other parents let their daughters have all the dates they like, is not a good one. I realize that it makes a young girl like yourself feel persecuted when she cannot do what other girls are permitted to do; at the same time, you must remember that if your parents were content just to follow the example of other parents, they could let you find your way into all kinds of trouble. There are too many weak and foolish parents in the world today; too many whose example would be the worst possible thing for your parents to follow. Your question is, then, apart from what the other girls are permitted to do, this: Should a high schoolgirl of 16 be permitted to go out with a boy (or boys) more than once a week, and should she be permitted to do so without having a protective older brother tagging along? To the first part of the question I would say that once a week is a generous quota of dates for a high school girl who wants to get some lasting good out of her high school studies. If you go out two or three times a week, it is almost certain that you won’t do very well in your studies, and never in your whole life will you be able to make up for that. Furthermore, I would say that it would be very imprudent for you to go out even as often as once a week if it were always with the same boy. That would add greatly to the danger of sin and to the wasting of time in high school. I know you will tell me that there are dozens of girls who do this, and I will answer that by telling you that there are dozens of high school girls who fall into sin and wreck their characters and waste their education by steady company-keeping. As to having your older brother with you on your dates, there is much to commend this safeguard. High school girls and boys are best off in crowds or, at least, groups of four or six. When young people insist on their right to be alone with their dates, there is a suspicion that they want to be free to do things that are wrong, such as kissing, petting, etc. Your parents are pretty wise, but I feel sure that if you convince them that you are not going to permit any evil actions by any boy, they will let you go out once in awhile on your own. 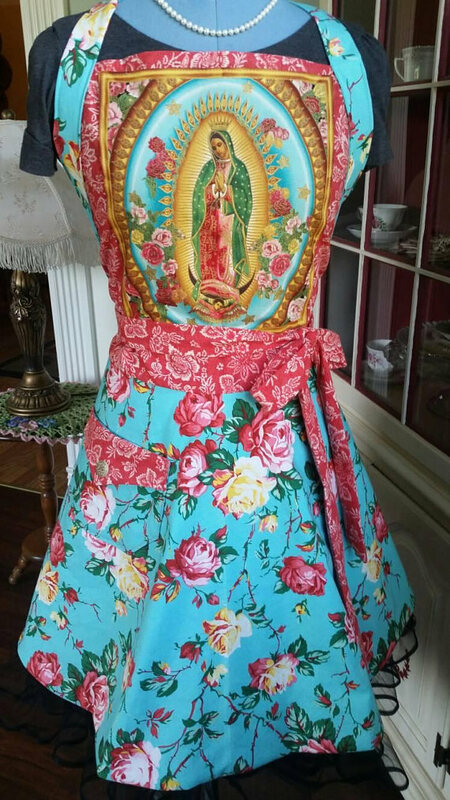 Beautiful, feminine aprons available at Meadows of Grace! Visit My Book List for the Youth for some good reading material! Thank you for your efforts here. I can’t help but ponder what has happened to our Church? Where is this guidance and wisdom today? It’s hard to not read these posts and be disheartened by the lack of such Godly wisdom and advice for our children being offered by our priests today. Instead they often take the position of the child who wants to date etc. as not only understandable but reasonable and acceptable. Very very good! I wish so badly some I know would have followed this advice.